One of the most talented and prolific artists working in the tiny—but growing!—field of printable cardstock miniatures is Jess Jennings, the man behind Trash Mob Minis. This week, Jennings announced the second anniversary of Trash Mob Minis’ commercial debut on DriveThruRPG/RPGNow, and I thought I’d celebrate the occasion by looking back over the Trash Mobs collection with you. I first encountered Jennings at the Cardboard Warriors papercraft gaming forum, where he posts under the handle Chiefasaur. It’s no secret in that community that I’m a huge fan of his animation-inspired figures, and that I especially enjoy recoloring them to make my own rainbow-colored hordes of lizardmen, skeletons, wolves, and rats. I find that his Pixar-esque style, featuring strong lines, bold colors, and broad rather than fine detail, not only reads well on the gaming table. It also lends itself readily to recoloring and other forms of modding—perfect for the DIY gamecrafter! In fact, I’m offering several of my recolors of Trash Mob Minis beasts as prizes in the big PnPG subscriber-drive contest I’m announcing later this week! Before I dive into Trash Mobs line, let me tell you where to find Jess Jennings and his work online. His minis sell exclusively through DriveThruRPG and RPGNow. He’s active on Twitter, and posts photos to Instagram, where you’ll often get early peeks of as-yet-unreleased minis; he posts as @trashmobminis on both platforms. He has a blog on Tumblr, I Rolled a 1, where he posts as Chiefasaur—that’s a great place to ask him a question or offer a compliment. I also found a fun interview with Jennings from back in 2016, just after he’d launched Trash Mob Minis on DTRPG. Its great to see how his early plans for the line have been fulfilled and exceeded. The Trash Mob Minis line debuted with two sets in June of 2016, the Goblins Army Pack, and the Scales and Slime Theme Pack. The next month, Jennings had added the Bone Thrower Model Kit and the Ultimate Elementals Paper Miniatures. By the end of 2016, the Trash Mob Minis line included 12 sets of printable miniatures, and two years later, there are 29 sets in the catalog. But since themes matter more to gamemasters than history, I’m going to attack the Trash Mob Minis line thematically rather than chronologically. My hope is to provide a brief User’s Guide to Trash Mobs. Novice heroes often face tribes of familiar humanoids, and Trash Mob has all the classics. Here they are, from smallest to tallest: The Kobold Army Pack is led by an armored chieftain, and includes a stabber, a slinger, a caster, and an urd (winged kobold, according to Volo!). There’s also a guard lizard the size of a large dog, with optional 2.5 wings that turn it into a dragon hatchling—very handy! The Goblin Army Pack has a boss, a shaman, a shooter and a stabber, along with a goblin zombie and the happiest goblin skeleton you ever met! Once the adventurers level up once or twice, they’ll be ready for bigger foes. The Hobgoblin Army Pack is a bit more formidable than their goblin cousins, with a commander, a war caster, an archer, a ninja, and even a bugbear for some surprise muscle. The Orcs Army Pack features both green- and gray-skinned versions of an orc shaman, battle-queen, warrior, and archer, who are supported by a fierce orc skeleton and a savage but faithful battle-boar. Rounding out the Army collection is my personal favorite, the Gnolls Army Pack, which perfectly captures these cruel-but-crazy hyena-men. A gnoll spearman, a cursed fang, and a flind all serve the pack queen, who is also guarded by a gnoll witherling and a trained hyena. As the party delves deeper underground, they’re likely to encounter a wider variety of increasingly dangerous monsters. Trash Mob offers all the classic dungeon denizens in a handful of variety packs. Random Encounters Pack 1 offers the basilisk, catoblepas, fungus man, and medusa, along with two old-school favorites, the landshark (a bulette by any other name) and the owlbear. The Dungeon Dwellers 2.5D Model Kit enters another dimension, bringing us 6 classic monsters that reach out to grab your heroes, but still store flat! In this kit are cockatrice, displacer beast, gargoyle, hydra, roper, and rust monster. If you’re wondering what you just stepped in, it’s probably something dangerously icky from the Ooze Theme Pack, which includes oozes, bone jellies, and slime girls(?) in two sizes and four colors each! And when the heroes are ready for the big leagues, there’s Trash Mob’s Big Trouble Theme Pack, which throws oversized threats at them including an ettin, girallon (a giant, four-armed white ape! ), minotaur, ogre, oni, and an old-school, green-skinned troll. When the adventurers are ready for some moonlight madness, Trash Mob Minis has two sets of were-beasts ready to go. Lycanthropes Theme Pack includes the go-to skin-changers, the savage werewolf and the mangy wererat, along with a wily weretiger, while Lycanthropes Theme Pack 2 expands the were-roster with the werebear, wereboar, and jackalwere. Each Lycanthropes set includes the hybrid man-beast form for each type, as well as its pure animal form. The animal forms are perfectly suited to double-duty as conventional beasts, making these sets tremendously useful. Using the techniques described in my tutorial, Recolor Printable Minis with GIMP, I’ve modded up wolves, cats, rats, boars, bears and jackals in a wide range of colors, some of which will be included in the prize packages for PnPG’s first contest. Night time is also the right time for a hags’ coven, and the recently-released Hags Theme Pack has that need covered. The pack includes the familiar night hag, sea hag, and green hag, along with the new types revealed in Volo’s Guide to Monsters, the towering annis hag and the frosty bheur hag. Keeping the five old ladies company is a voodoo-approved coven minion—a derby-wearing gator, ready to drop an evil eyeball into the hags’ brew! And what would you expect to be lurking outside a hag’s hut but a bramble full of evil, awakened plants? The Plant Monsters Theme Pack offers a twig blight, vine blight, and needle blight to guard the hags’ gathering, along with a vegepygmy, vegepygmy chief, and a thorny hound. Whether your heroes venture to the elemental planes, or some evil sorcerer turns the elements against them, you’re going to need a healthy supply of elementals. The Ultimate Elementals Theme Pack brings you medium and large elementals to defend the realms of Earth, Air, Fire and Water, along with a hooded sorcerer specializing in each element. But in this context, “ultimate” doesn’t mean “last,” because Trash Mob Minis recently released the Elemental Enemies Paper Miniatures Set, broadening the array of elemental enemies to send against your heroes. For each of the four elements, this set includes a large, armored elemental, a cult leader and an elite cult guard. There’s also a unique elemental entity representing each element—an azer (fire dwarf), a dust devil, a water serpent, and a galeb-duhr (boulder beast)—bringing the final count on this set to 16 unique figures! Without dragons, the game would just be called Dungeons And. Fortunately, Jess Jennings doesn’t leave us hanging like that. Instead, he brings us no less than six separate sets of minis covering dragons, dinosaurs, lizardmen and other reptiles. Towering over all the rest, the Dragons 2.5D Model Kit includes no less than seven gigantic dragon figures, each with separate wings that spread out to either side. The roster includes shadow, bone, red, green, black white and blue dragons, all of which spread their wings across the table, but still store conveniently flat. The Prehistoric Panic Pack is another huge collection of 16 minis, this time of dinosaurs to challenge the dragons’ primacy. The set includes live, zombie, and skeletal versions of T-rex, dimetrodon, allosaurus, velociraptor, and lambeosaurus, plus a super-sized “Titan Rex.” Chiefasaur is obviously up on current dino science, since the T-rex and the velociraptor are both sporting feathers! If you’re looking for lizard folk, you’ll find swordsman and a shaman in the Scales and Slime Theme Pack, along with a giant toad, a bullywug, a scimitar wielding snakeman, and a man-sized cobra. Two more lizardmen, an archer and a brute, are included in both mounted and standing poses, along with their reptilian mounts—a riding lizard and a large carnivorous dinosaur—in the Reptile Riders Cavalry Pack. You’ll find another burly lizardman, along with several varieties of snake-men Yuan-Ti in the Empire of Snakes Army Pack, featuring a huge, 2.5D winged quetzalcoatl. An assortment of terrible turtles attacks in the Turtle Tyrants Army Pack, Jenning’s homage to a classic 8-bit, sidescrolling video game, ready to take over your tabletop swamps and dungeons! You’ll also find dragonborn and turtlekin adventurers scattered throughout the Trash Mobs Hero Packs, detailed next. And don’t forget the Kobold Army Pack, described above, when you’re recruiting minions for one of your dragons! Trash Mob Minis has released five sets of player character miniatures so far, skipping over some of the obvious tropes–dwarf fighter, elven mage–to offer a more eclectic assortment of harder-to-find PC types. Jennings includes a tiefling and a dragonborn in almost every set, and several gnomes and halflings have appeared as well. He also deserves credit for creating as many female adventurers as male, matching the increasing diversity around today’s gaming table with diversity on the battlemat. Congrats to Trash Mob Minis! If you’re not familiar with the Trash Mob Minis line, I strongly recommend you check it out. The art style may seem a bit lighthearted at first, but I regularly use Trash Mobs on the table alongside printed minis from artists with very different styles, such as Printable Heroes, Paper Forge, OkumArts, One Monk and Permes, as well as other gamers’ plastic 3D minis, and they all look fine together. In fact, it’s the Disney-villain attitude that so many Trash Mobs have that makes me love the line so much. Slightly silly villains, like gnolls or kobolds, are a great place to start with Trash Mobs Minis, by the way! 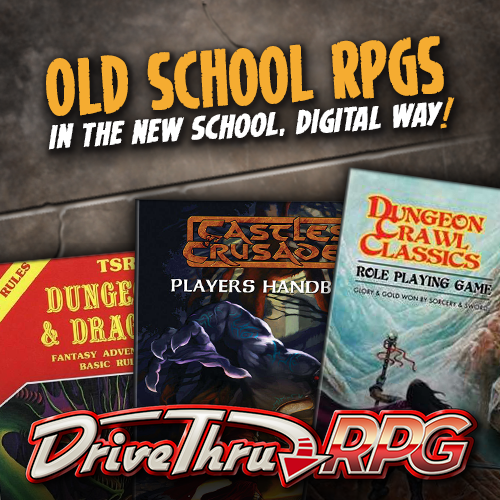 So swing by DriveThruRPG and pick out a set or two, and give them a try. Then drop by Twitter, tumblr or the Cardboard Warriors Forum and let Jess Jennings/Chiefasaur know how much you like them! Hi Jeff, I recently discovered your blog. Your well-written and nicely illustrated articles make me think about doing some papercraft modeling myself during the upcoming summer holidays. This seems a perfect way to do some skirmish war gaming without the big investments which are usually necessary (I am especially short on time due to my young children, job and coursework). I bought some of David Okums minis on DtRPG and am currently thinking about rules, scenarios and scenery. Thanks for the inspiration and keep up the good work. Thanks, Pieter. Your life sounds a lot like mine! Okumarts’ minis were the first ones I found as well, and I love David’s work too. I’m sure I’ll do a feature like this on David’s line and several others, over time. I’m glad you’re enjoying the blog, and I’m sure you’ll have a blast gaming with printable minis. Let me know what rules sets you try…I’m always eager to hear about new games! Hello Jeff, great article! Where did you buy your paper miniature bases? Thanks! Those bases are made by a company called Litko, and they’re the best basing solution I’ve seen so far. Litko has a website where you can order many, many different base configurations, along with other laser-cut acrylic stuff like templates for games like X-Wing and Gaslands. But if you already have an Amazon Prime membership, most of the common sizes of Litko bases are available there with Prime shipping, so you can save several dollars that way. I use all round bases, and have them in 20mm, 25mm, 40mm and 50mm sizes. 25mm is best for human-sized figures, and that’s the size you will need the most of, and it’s one of the sizes on Amazon Prime. Hi Jeff I have every one of your sets so far. As an artist myself I think your style is brilliant, just got the Boarbarians and as I was born in the year of the boar (1947) I love these, can`t wait to see what you create next. As I haven`t either the skill or the money for plastic or metal minis yours are affordable. Hey, Dave! Thanks for reading the PnPG blog. I couldn’t agree more with the nice things you have to say about the Trash Mob Minis line, but I have to admit that like you, I’m just a fan and collector of these amazing printable miniatures. The creator behind this great and growing range of gaming miniatures is Jess Jennings, a far more talented artist and designer than I will ever be. I’ve never met Jess face-to-face—he’s on the west coast of the US, and I’m on the east coast—but we’ve conversed occasionally through the Cardboard Warriors papercraft gaming forum. I assure you, he’s as nice a fellow as he is talented. There’s a short but interesting interview with Jess Jennings at the G2V website, if you want to hear from him directly.